How Can I Remove Exhaust System Blueing? When chrome or stainless steel exhaust tips get hot enough, they typically take on some blue coloration. This blue color can be uniform in appearance, but more frequently it’s uneven and sometimes it’s even spotty. This process is known as “blueing,” and it’s a pretty common occurrence. What follows is an explanation of the process and what you can do to stop it (assuming you don’t like it). Stated simply, heat is the cause of blueing. When chrome exhaust pipes (or headers or tips or any other sort of polished chrome surface) are exposed to temperatures in excess of 500 degrees, the chromium coating on these parts begins to oxidize. This new oxidization layer is incredibly thin, which means that it is nearly transparent except for a slight blue or yellow tint. Of course, the “slightness” of the blueing will depend on the number of times a part is exposed to high heat. If your chrome exhaust pipes only reach those high temperatures once in a while, the blueing might be barely noticeable. On the other hand, the amount of blueing might be pretty intense if your exhaust system gets hot on a regular basis. The solution to removing blueing on chrome (as well as blueing on stainless steel) is to polish the metal with a slightly abrasive chemical that will scrape off the oxidized layer. Provided you use a good product – Bar Keeper’s friend is popular and very effective – and you’re willing to do the hard work, you can buff and polish away any discoloration. However, the blueing will return very quickly if you don’t also figure out how to protect your polished surface from high heat. If we’re talking about protecting exhaust tips from blueing, the solution might be as easy as increasing the overall diameter of the tips or inserting a slightly smaller pipe inside the tip to act as a buffer between the tip and the exhaust gases. If we’re talking about a set of polished headers, the best solution is a heat shield. Also, if your exhaust system has blueing, you might want to check the air/fuel mix (bike owners especially). Running too lean can cause extreme exhaust temperatures and lead to all sorts of problems in addition to discoloring your polished metal parts. Finally, there are some polishes that promise to protect your metal surface from future blueing. While these polishes definitely can help prevent discoloration, they’re not able to prevent parts from getting hot. If you really want to prevent blueing, you need to figure out how to protect your parts from heat. Personally, I don’t think that blueing is always a bad thing. Running my engine hard is going to create heat, and I think blueing is a sign of an engine that gets used and therefore a positive. While I’m not a huge fan of splotchy blueing, I recognize that is a common end result. Over time, the splotchy appearance tends to even out as well. 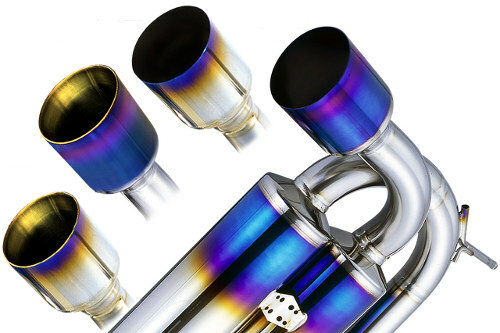 In addition to chrome or steel blueing, I also think that the similar process can be very attractive on Titanium exhaust parts (sometimes known as “purpleing”). Titanium takes on a purple tint once it’s exposed to enough heat, and there’s no surer sign that your exhaust system is for real than a little heat discoloration. Many in the sport-compact scene, for example, spend extra money on titanium exhaust tips that are pre-purpled. So if I take a blow torch to it it will turn blue? Maybe. You might cut it too. Okay don’t mean to sound like im dogging this write up but it is jist stating the obvious. Where does it point someone in the right direction of a trusted or prefered product to remove said coloration even if it’s temporary….I know you might suggest I use google but when “how tos” like this one are comming up in the search results, it might as well be deleted. A fair point. What the article didn’t point out is that any metal polish will work – just make sure that it’s for stainless steel. Bar Keeper’s Friend is a popular and generally excellent product. Check out Blue Job.. powder paste remover for blueing and yellowing. Best I’ve seen so far.